The history of obstetrics is interesting. (Yeah, I know this is a strange opening sentence for a blog about visual business intelligence, but bear with me.) Its history even includes a bit of unexpected intrigue, such as the early history of forceps. Because forceps delivery was so wildly successful for complicated births, the London-based Frenchman who invented the procedure and his family of physicians refused to reveal the technique for three generations, hiding it even from the mothers giving birth through use of a drape, until they passed it on to a physician in Amsterdam who kept it to himself for 60 more years. A particular event in obstetrical history actually has something to teach us about the importance of performance measure, which we can apply to business. 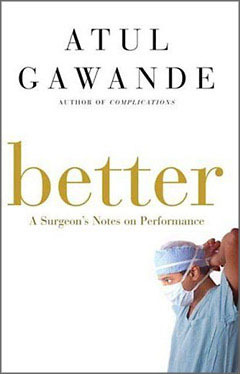 It involves something called the Apgar score, which I learned about by reading Atul Gawande’s wonderful book about healthcare, Better: A Surgeon’s Notes of Performance (Metropolitan Books, New York, NY, 2007). You’ll get a flavor of Gawande’s writing in a couple of quotes from the book below. During the 20 years or so leading up to the 1950s, great progress was made through tighter medical standards and the introduction of antibiotics, especially penicillin, in improving the odds of the mother surviving the delivery. Up until the mid-1930s, childbirth was the single most dangerous event in a woman’s life. By the 1950s, the risk of death decreased from one of every 150 births resulting in the death of the mother, to only one in 2,000. Despite this dramatic improvement, babies still weren’t faring much better than before. One in 30 still died at birth. Virginia Apgar, the first woman to be admitted into surgical residency at Columbia University College of Physicians and Surgeons, became an anesthesiologist during this period. She developed particular concern for the fate of newborns, which at the time were left to die if they were “malformed or too small or just blue and not breathing,” because doctors assumed that nothing could be done to save them. Apgar wasn’t an obstetrician, but she was so convinced that deliveries could be done better, she took it upon herself to challenge the system. She did so by devising a score, which is still routinely used in hospitals today, and is called the Apgar score. Nurses use the Apgar score to rate the condition of newborns on a scale of zero to 10. An infant got two points if it was pink all over; two for crying, two for taking good, vigorous breaths, two for moving all four limbs, and two if its heart rate was over a hundred. Ten points meant a child born in perfect condition. Four points or less meant a blue, limp baby. Apgar published her procedure in 1953, the year preceding my own birth. It probably saved my life, for I was so anxious to get going, I tried to breathe before emerging from the birth canal into the world of air. The Apgar score was immediately adopted, resulting in a dramatic turnaround. The score turned an intangible and impressionistic clinical concept—the condition of new babies—into numbers that people could collect and compare. Using it required more careful observation and documentation of the true condition of every baby. Moreover, even if only because doctors are competitive, it drove them to want to produce better scores—and therefore better outcomes—for the newborns they delivered. Babies were examined and their condition scored immediately upon delivery and then again after five minutes. Because of this process, it soon became apparent that babies with low initial scores could be revived to score in the acceptable range within five minutes, with the right care. Part of the reason the Apgar score worked so well is because it was easy to calculate and understand. This is true of business performance measures as well. Measures that people can’t understand or are too hard to figure, rarely catch on. The very existence of a measure—a number—makes performance tangible, something people can think about in concrete terms and invent responses to improve. As long as performance remains nebulous and abstract, it won’t change for the better. People need a measure to wrap their heads around. When the Apgar score was first introduced, no one could imagine the difference it would make. I doubt that Apgar herself foresaw the way that her score would incite doctors and nurses to compete with themselves and one another. When people have a way to evaluate their performance, they are naturally inclined to do better and better. In my work, I help people examine, make sense of, and then present quantitative data to others, including key performance indicators (KPIs), through the use of visual representations. Visualization makes data accessible in a way that brings meaningful patterns, trends, and exceptions to light. Data visualization isn’t helpful, however, unless you have the right numbers—numbers that actually measure what needs to be measured and do so in a way that can be understood. Great story. I learned several years ago to use a ten point scaing system in training managers, teachers, counselors and anyone trying to improve learning. Comparing ourselves to our peers is such a basic human tendency. The memes “One-up-manship” and “Keeping up with the Joneses” are relevant because they exposes the fact that many, if not all of us, aspire to a type of belonging and competition. This hits on an interesting concept for me: Some measurements need not even be accurate or highly precise to give us a basic understanding of our position as long as those measurements represent a relative position between ourselves and those we perceive to be in our peers. Obviously like any tool, such scales can used and abused motivating poor behavior when strategically misapplied. A friend of mine is an RN at a hospital labor and delivery unit in a community full of high achievers. She tells me that it’s not only nurses who compete. This is the first time in the kid’s life it’s ever scored on anything, and the parents too pay attention to the number. They want their kid to have the best score possible. Trouble is, every baby has at least a tiny bit of blue skin on the hands and feet, so no one ever gets a perfect score, a 10. It’s the parents’ first lesson in making do with what nature delivered. From this article I assumed that there was a significant decline in neonatal mortality rate due to the adoption of the Apgar score. However, I couldn’t find a correlation between the Apgar score adoption and a steep decline in neonatal mortality rate somewhere between 1950 and 1970. Is there something I’m missing? By the way, I really like your articles and blog. Keep up the good work! The only statistics that I’ve seen regarding historical changes in neonatal mortality in the United States are those that Gawande reports in his book. Apparently, it took awhile for the Apgar Score to catch on and spread throughout the United States, and then some time for improvements in neonatal care that were introduced because of the Apgar Score to be implemented, which might account for the latency that you’ve observed in the statistics. According to Gawande, however, once it did catch on, newborn deaths were reduced from about one out of 30 births to one out of 500 full-term births today. From what he reports, it isn’t clear that the previous mortality rate of one in 30 includes all births or only full-term births, as is true of today’s rate, so the comparison might not be precisely apples to apples. Nevertheless, the introduction of the Apgar Score is apparently recognized as the pivotal event that has led to today’s dramatically reduced rate of neonatal mortality. Thanks for this blogpost! I have the actual reference right now with regard to my personal thesis in my nursing subject. My teacher may like this.. I hope so.. Thanks once again!